Forge new legends in Middle-earth with The Lord of the Rings: The Card Game! Gather your friends and together take on the forces of shadow. 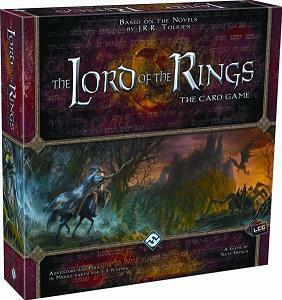 As the first cooperative Living Card Game, The Lord of the Rings puts 1-2 players (or up to four with two Core Sets!) in control of the most powerful characters and artifacts of Middleearth. Players will select heroes, gather allies, acquire artifacts, and coordinate their efforts to face Middle-earth’s most dangerous fiends. Following the Living Card Game format, The Lord of the Rings: The Card Game will be expanded by monthly Adventure packs that will expand player card pools while introducing new challenging scenarios for the players to undertake.